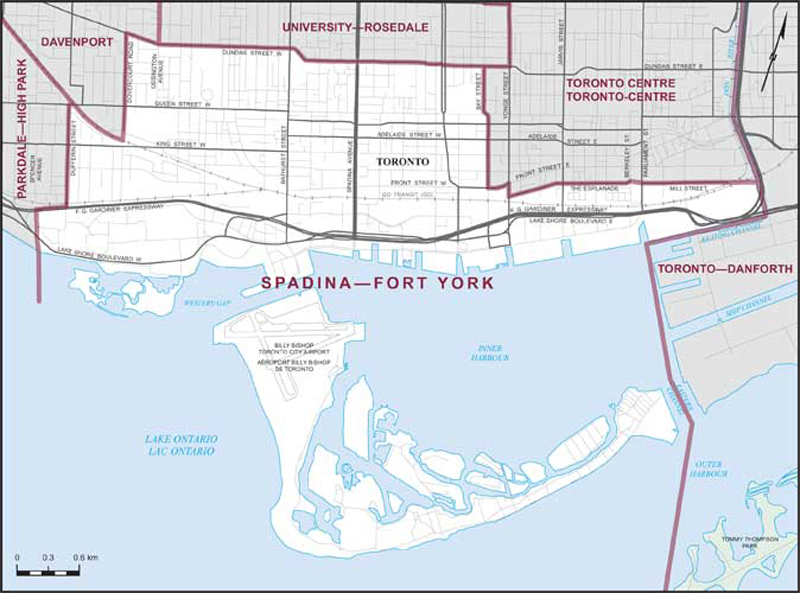 Spadina-Fort York is a federal riding, a provincial riding, and a Toronto ward, and the boundaries are identical. Being from British Columbia, and having spent most of my adulthood in Vancouver (which does not have a ward system), the riding boundaries do not match at all. The recent changes to the wards in Toronto (from 44 to a proposed 47 to an eventual 25) set the wards to match the provincial (and therefore federal) ridings. So we will have a situation where Toronto has a councillor, MPP (member of provincial parliament) and MP (federal member of parliament) represent the exact same people but with different responsibilities. I live in the Garment District of Toronto, which is a postage stamp neighbourhood comprising the area bounded by Spadina to Bathurst and Queen to King. I tell people I live at Queen and Spadina, though King and Spadina would be just as accurate. (Queen St. seems more famous than King St. to me.) I've been a member of the Garment District Neighbourhood Association as soon as I heard about it in 2016, and have gained their trust such that help run their Twitter and Instagram accounts and, to a lesser extent, their Facebook account. I have no plans on running for a board position, but I do like staying involved with them, helping make the neighbourhood as good as it can be. 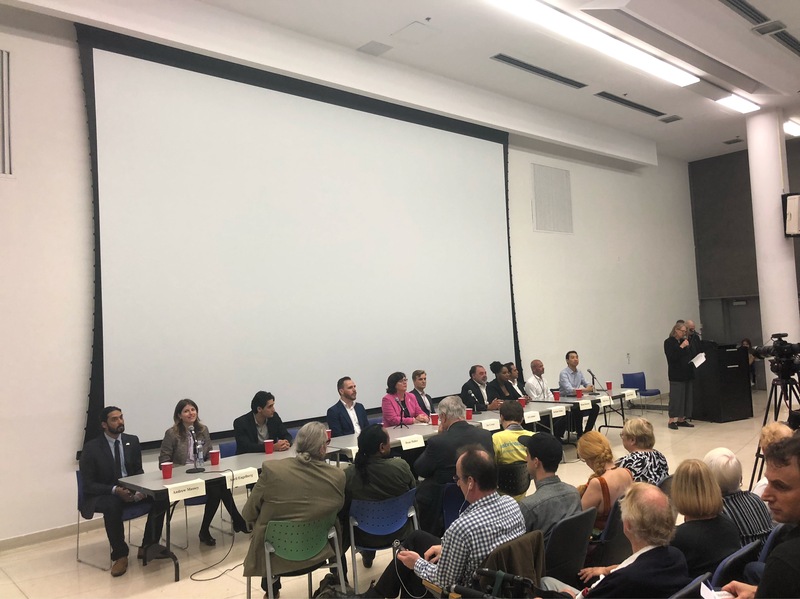 Tonight, along with 7 other neighbourhood associations, the GDNA presented and all-candidates meeting featuring men and women running for council. The MPP Chris Glover addressed the crowd (he noted he was allotted 45 seconds and stayed within that time). 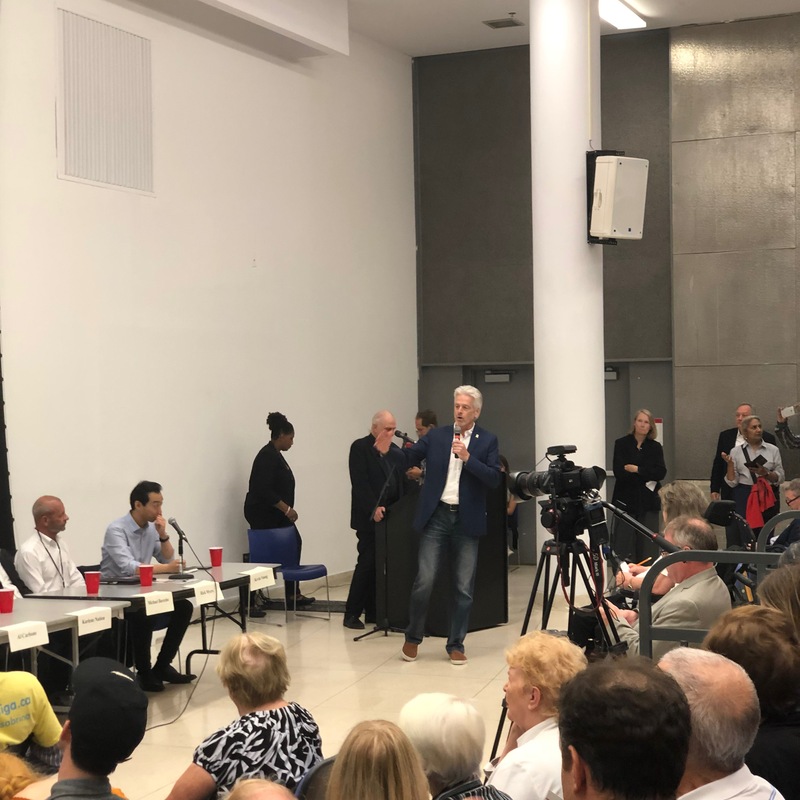 The candidates, seated randomly, would answer questions in that order, always starting with a the candidate next on the list for each question (so that people only went first once at most). Each got two minutes to speak. Everybody more or less stuck to time. I took notes on my iPhone, and there was no break for me for my fingers to regain their composure. (It would later emerge that the meeting was recorded.) The themes were housing affordability, community safety, population growth in the ward/riding, waterfront protection and revitalization (the riding includes the waterfront along Queens Quay, not to mention Toronto Islands and the Billy Bishop airport), and infrastructure (especially as it relates to flood protection). I barely heard mention of the King St. transit pilot, and not a peep from it from the candidate most opposed to it. To say I'm a supporter of the King St. transit pilot would be an understatement. Three or four candidates stood out for me as potentially getting my vote: the incumbent Joe Cressy, litigation lawyer April Engelberg, former banker and current officer in Her Majesty's Royal Canadian Navy Kevin Vuong (the only candidate on my list not to use Nation Builder for his website), and businessman Rick Myers. Due to the uncertainty around the which ward system the election would run under, and due to my not being in town on election day, I've had to rush somewhat to judgment on who I will end up voting for. Of the four above, I have little doubt they will remain involved in their communities and in politics, whether or not they call themselves a politician. Advance voting starts tomorrow, so I have about 48 hours to come down on a decision. I was heartened by what I saw at the all-candidates' meeting. Some clearly were not put on this earth to serve in public office, and some had the earnest belief that they can make a difference in their communities that I admire, so I hope that the latter will continue with that attitude afterwards and stay politically even though their candidacy for council is a long shot.